A decision has now been taken which means that LiU will procure one financial management system to handle all financial processes. LiU currently uses three different systems for the different financial processes: Palette for electronic invoice management, Proceedo for procurement, and the Agresso financial management system. The decision was made after a workshop with an extended steering group (picture). 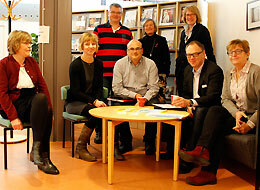 The group comprises Chief Financial Officer Agneta Frode Blomberg, Chief Information Officer Joakim Nejdeby, Head of Department Per-Olof Brehmer and Heads of Administration Lena Bernström and Anne-Li Silberk. Also participating in the workshop were University Director Kent Waltersson, Head of Department Christina Ekerfelt and Senior Coordinator Gun Djerf. There are both benefits and drawbacks to having a joint system, but the workshop group concluded that the benefits outweighed the drawbacks. Occasional users gain increased access and a better overall view of all the financial operations, and a single system is more efficient in terms of resources and reduces the amount maintenance and administration. And the agreements with Agresso and Palette are not fixed-term (something required according to the public procurement act); the agreement with Proceedo expires in 2018, and with Agresso the version used by LiU will not be supported by the supplier for much longer. The new financial management system is a major project that will run for a number of years, affecting many members of staff. A requirements analysis forming the basis of the invitation to tender will be ready in the spring of 2015. Making the decision about the supplier is planned for after the summer; later, during the autumn, implementation can begin. Then there will be many people who need training in the new system.